Our history extends almost 90 years, first as part of the Archdiocese of Philadelphia and then as part of the newly established Diocese of Allentown since 1961. The Mother Church of the Lehigh Valley, St. Bernard Parish, was established in Easton in 1820. After nearly a century, the Catholic population of our area grew tremendously and St. Bernard Parish was unable to minister to it. A small tract of land in Wilson Borough, once home to a racetrack at “Fairview Fairgrounds”, was destined to become the home of St. Jane Parish. Founded on January 19th, 1920 by Father Michael A. Bennett, St. Jane Frances de Chantal Parish consisted of only 200 families. The new church celebrated its first Mass in Bondon Hall, a former feed store located at 15th and Washington Streets. Later, the fledgling parish purchased a home at 19th St. and Hay Terrace to house the church rectory. A workshop at the rear of the home was converted into a small chapel by men of the parish. Holy Mass was celebrated here until 1926. On March 15th, 1924, groundbreaking ceremonies were held to begin construction of church/school building at 1922 Washington Boulevard. The new building was dedicated on December 20th, 1925 by Monsignor Joseph Whitaker, Chancellor of the Archdiocese of Philadelphia. The addition of the basement auditorium added a new dimension to parish life with social and athletic events. The earliest known society in the parish, St. Jane Sewing Society, became the backbone of social activities. After years of attending class at St. Bernard School, 176 pupils entered the doors of St. Jane School on September 8th, 1926. The school was staffed by the Sisters, Servants of the Immaculate Heart of Mary from 1926 until 2002. Their first convent was opened in October, 1926. The foundation of today’s Home and School Association, the St. Jane Education Association, was formed in 1938. In July of 1955, Father James J. Donnelly purchased two homes at 1942 and 1946 Washington Boulevard which were converted into a combined convent and chapel. The former convent became the priests’ rectory, which is now the Conference Center. Major renovations to the old school building were completed in 1959 under the direction of Father James A. Farrell, who strongly encouraged parochial education at St. Jane Parish. However, the old church/school building, which is now Father Farrell Hall, quickly became too small. By 1960, after 40 years, St. Jane Parish had grown to 1200 families. Ground was broken on January 23, 1959 for a new church/school building on the same block as the original church/school. It was dedicated on October 2, 1960 by Bishop Joseph M. McShea in conjunction with the 40th anniversary of St. Jane Parish. The location of the new basement church was intended to be temporary. Again more room was needed for the school and in 1962 a new school was built above the church. By 1965, the new school housed nearly 800 students with 50 in each room. The teaching staff grew to 19 and half of them were IHM Sisters. Today, there are nearly 500 students attending St. Jane School supported by the principal with 30 teachers and staff. Close to 550 public school children are involved in the Parish Religious Education Program which is run by a coordinator and 40 catechists. 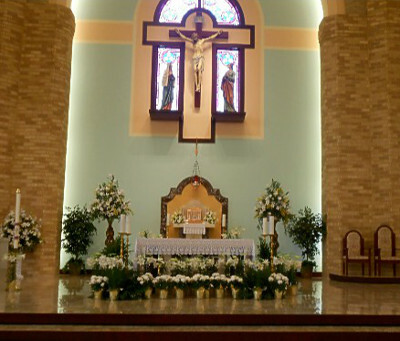 In the 1980s, Father Joseph A. Sheehan had the interior of the church renovated. 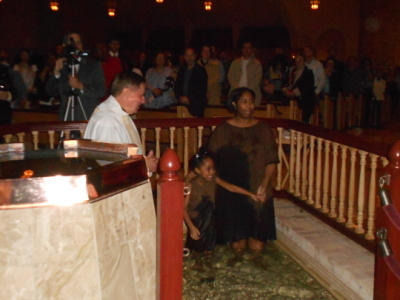 In the early 1990s, the parish successfully completed the first capital campaign for the construction of a new church. The “Challenge of Faith” raised over $1,500,000. In the late 1990s, Monsignor Gerald E. Gobitas initiated a second building campaign called “A Time to Build”. Land was purchased in Palmer Township and the new St. Jane Church was built. It was dedicated by Bishop Edward P. Cullen on February 3, 2002. In June, 2002, Monsignor Gobitas was named Chancellor of the Allentown Diocese. Monsignor Stephen J. Radocha, V.F., our current pastor, came to St. Jane Parish at that time. We cannot observe the flowering of faith which we experience at St. Jane Parish without at the same time turning our eyes and grateful hearts to those who have laid the groundwork for what has become our vibrant and blessed parish. While the first 40 years saw great growth and expansion of the church and school, the last 50 years have brought growth and rejuvenation to our parish which now has more than 3600 families. The Holy Spirit has truly revived our liturgies and our lives, the laity has come of age, called to service in our church, and we are witnessing a true renewal of the full Christian life of the family. Our abundant gratitude reaches out to everyone who has contributed their time, talent, and treasure to make St. Jane Faith Community the holy, productive, and dynamic reality that it is. With the Holy Spirit’s guidance, we look forward to the challenges that lie ahead with great energy and enthusiasm. It is God’s good pleasure that has brought us together in this parish under the protection of our Patroness, St. Jane Frances de Chantal. Let us celebrate our many blessings by always following her motto: “LIVE JESUS”.